Gonzalo, the 7th named storm of the 2014 Atlantic hurricane season, made landfall in Bermuda on Friday night. Despite being downgraded from a category-3 to a category-2 hurricane just prior to coming ashore, the storm still caused extensive damage. Producing a top wind gust of 140-mph and generating waves over 40 feet high, the storm toppled trees and downed power lines. Approximately 90% of the island chain lost power. Crediting advanced preparations, local officials say no fatalities or serious injuries have been reported. 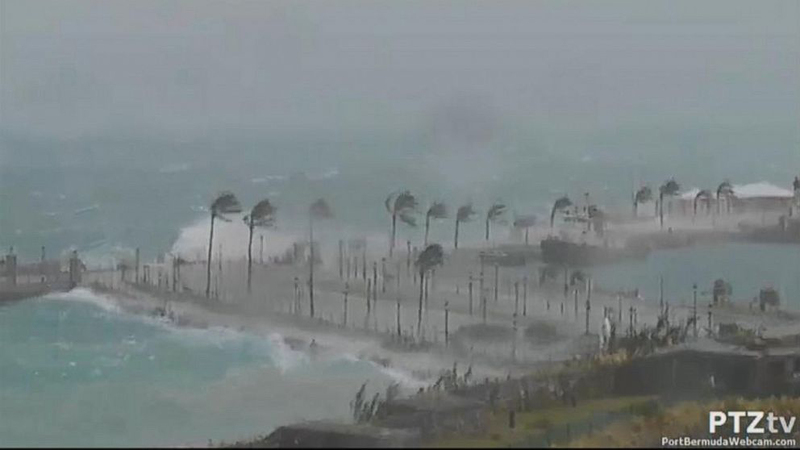 Gonzalo was the second tropical system to hit Bermuda is less than a week. Tropical Storm Fay slammed the popular vacation spot just last Sunday with strong winds and heavy rain. The last time Bermuda was hit twice in one week was when Tropical Storm Emily and Hurricane Floyd both moved over the archipelago in early September 1981. Spring is the season most commonly associated with twisters in the United States. Autumn, however, can be just as dangerous and is known as the “second season” for tornadoes. According to NOAA, approximately 1200 tornadoes touch down in the US every year. While most occur in “Tornado Alley”, in the central part of the country, activity there tends to peak in May. The second season is most active in the mid-south, an area often referred to as “Dixie Alley”. During the transitional months of autumn, the jet stream frequently dips south bringing cooler air into the region. At the same time, warm, moist air is flowing in from the Gulf of Mexico. When these two different air masses meet, the local weather can get very active. In fact, some of the largest tornado outbreaks of any month have occurred in October and November. 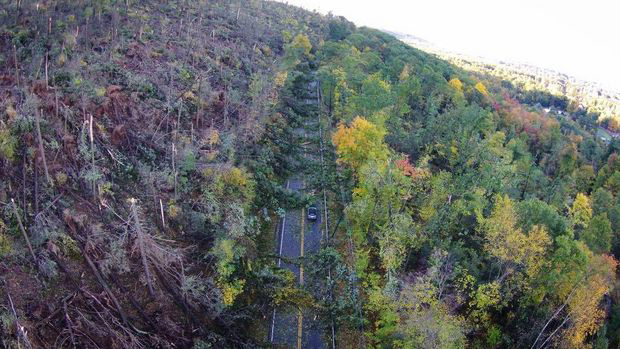 A strong microburst toppled trees and power-lines in the town of Easthampton, Massachusetts early Wednesday morning. With winds in excess of 100mph, the damage to the area was equivalent to an EF-1 tornado. According to the National Weather Service in Boston, the powerful storm cut a path of destruction one mile long and a quarter mile wide. No serious injuries have been reported. 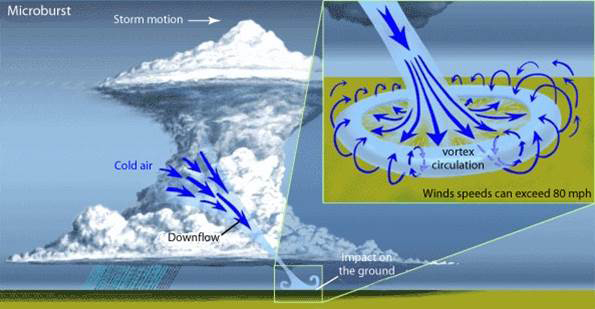 A microburst is a powerful, but short-lived, downward moving column of air generated by a thunderstorm. It produces intense straight-line winds – as opposed to the rotating winds of a tornado – that generally impact localized areas less than 2.5 miles wide. Science and the performing arts have joined forces to expand the public discourse on climate change. In Extreme Whether, a play written and directed by Karen Malpede, the issue is viewed through the personal lens of a bitter family fight over land stewardship. The Lamont-Doherty Earth Observatory – part of Columbia University’s Earth Institute – will be hosting an Open House on Saturday, October 11th. This public event offers tours, lectures, and panel discussions on a range of earth science topics, including climate change. The program also includes a talk about the long and short term responses to Superstorm Sandy. For more information, including directions and the day’s schedule, visit the LDEO website. 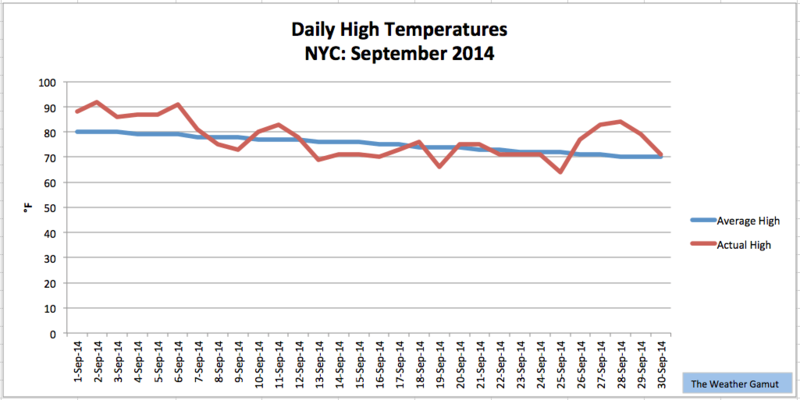 September 2014 was warm and dry in New York City. The month saw temperatures reach into the 90s on two separate occasions and it even produced our hottest day of the year. All together, despite a few cooler than average days in the middle of the month, the city’s mean temperature for September was 69.9°F. That is 1.9°F above average. In terms of precipitation for September, rain events were few and far between. Only 1.21 inches of rain was measured in Central Park, which is 3.07 inches below normal. That makes September 2014 the city’s driest September in nine years. 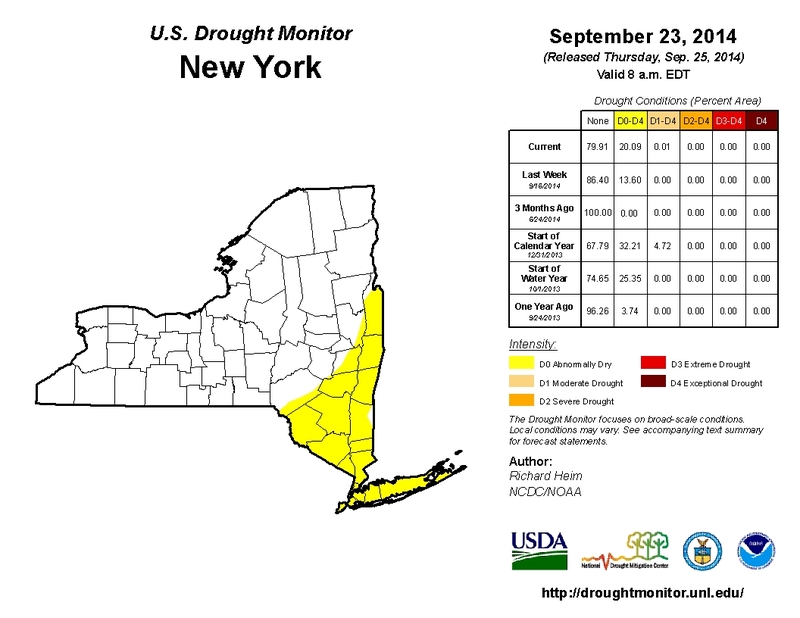 As a result, the city, along with most of the southeastern section of New York State, is currently listed as “abnormally dry” on the U.S. Drought Monitor.